What an exciting year for distance learning! Cutting-edge communication systems allowed colleges to escape the tired confines of face-to-face education. Bold new technologies made it possible for thousands of geographically dispersed students to enroll in world-class courses. Innovative assessment mechanisms let professors supervise their pupils remotely. All this progress was good for business, too. Private entrepreneurs leapt at the chance to compete in the new distance learning marketplace, while Ivy League universities bustled to keep pace. True, a few naysayers fretted about declining student attention spans and low course-completion rates. But who could object to the expansively democratic goal of bringing first-rate education to more people than ever before? The new pedagogical tools promised to be not only more affordable than traditional classes, but also more effective at measuring student progress. In the words of one prominent expert, the average distance learner "knows more of the subject, and knows it better, than the student who has covered the same ground in the classroom." Indeed, "the day is coming when the work done [via distance learning] will be greater in amount than that done in the class-rooms of our colleges." The future of education was finally here. 2012, right? Think again: 1885. The commentator quoted above was Yale classicist (and future University of Chicago President) William Rainey Harper, evaluating correspondence courses. That’s right: you’ve got (snail) mail. Journalist Nicholas Carr has chronicled the recurrent boosterism about mass mediated education over the last century: the phonograph, instructional radio, televised lectures. All were heralded as transformative educational tools in their day. This should give us pause as we consider the latest iteration of distance learning: massive open online courses (MOOCs). In response to the "MOOC Moment," skeptical faculty have begun questioning venture capitalists eager for new markets and legislators eager to dismantle public funding for American higher education. To their credit, some people pushing for MOOCs speak from laudably egalitarian impulses to provide access for disadvantaged students. But to what are they being given access? Are broadcast lectures and online discussions the sum of an education? Or is an education something more than "content" delivery? To state the obvious: there’s a living, human element to education. We who cherish in-person instruction would benefit from a pithy phrase to defend and promote this millennia-tested practice. I propose that we begin calling it "close learning." "Close learning" evokes the laborious, time-consuming, and costly but irreplaceable proximity between teacher and student. "Close learning" exposes the stark deficiencies of mass distance learning such as MOOCs, and its haste to reduce dynamism, responsiveness, presence. Techno-utopians seem surprised that "blended" or "flipped" classrooms – combining online media with in-person discussions – are more effective than their online-only counterparts, or that one-on-one tutoring strengthens the utility of MOOCs. In spite of all the hype about interactivity, "lecturing" a la MOOCs merely extends the cliché of the static, one-sided lecture hall, where distance learning begins after the first row. The old-fashioned Socratic seminar is where we actually find interactive learning and open-ended inquiry. In the close learning of the live seminar, spontaneity rules. Both students and teachers are always at a crossroads, collaboratively deciding where to go and where to stop, how to navigate and how to detour, and how to close the distance between a topic and the people discussing it. For the seminar to work, certain limits are required (most centrally, a limit in size). But these finite limits enable the infinity of questioning that is close learning. MOOCs claim to abolish those limits, while they paradoxically reinstate them. Their naïve model assumes that there is always total transparency, that passively seeing (watching a lecture, or a virtual simulation) is learning. A Columbia University neuroscientist, Stuart Firestein, recently published a polemical book titled Ignorance: How It Drives Science. Discouraged by students regurgitating his lectures without internalizing the complexity of scientific inquiry, Firestein created a seminar to which he invited his colleagues to discuss what they don’t know. As Firestein repeatedly emphasizes, it is informed ignorance, not information, that is the genuine "engine" of knowledge. His seminar demonstrates that mere data transmission from teacher to student doesn’t produce deep learning. It’s the ability to interact, to think hard thoughts alongside other people. In a seminar, a student can ask for clarification, and challenge a teacher; a teacher can shift course when spirits are flagging; a stray thought can spark a new insight. Isn’t this the kind of nonconformist "thinking outside the box" that business leaders adore? So why is there such a rush to freeze knowledge and distribute it in a frozen form? Even Coursera co-founder Andrew Ng concedes that the real value of a college education "isn’t just the content.... The real value is the interactions with professors and other, equally bright students." "To become the absolute best place to work, communication and collaboration will be important, so we need to be working side-by-side. That is why it is critical that we are all present in our offices. Some of the best decisions and insights come from hallway and cafeteria discussions, meeting new people, and impromptu team meetings. Speed and quality are often sacrificed when we work from home. We need to be one Yahoo!, and that starts with physically being together." Why do boards of directors still go through the effort of convening in person? Why, in spite of all the fantasies about “working from anywhere,” are “creative classes” still concentrating in proximity to one another: the entertainment industry in LA, information technology in the Bay Area, financial capital in New York City? The powerful and the wealthy are well aware that computers can accelerate the exchange of information, and facilitate low-level "training." But not the development of knowledge, much less wisdom. Close learning transcends disciplines. In every field, students must incline towards their subjects: leaning into a sentence, to craft it most persuasively. Leaning into an archival document, to determine an uncertain provenance. Leaning into a musical score, to poise the body for performance. Leaning into a data set, to discern emerging patterns. Leaning into a laboratory instrument, to interpret what is viewed. MOOCs, in contrast, encourage students and faculty to lean back, not to cultivate the disciplined attention necessary to engage fully in a complex task. Low completion rates for MOOCs (hovering around 10 percent) speak for themselves. A devotion to close learning should not be mistaken for an anti-technology stance. (Contrary to a common misperception, the original Luddites simply wanted machines that made high-quality goods, run by trained workers who were adequately compensated.) I teach Shakespeare, supposedly one of the mustiest of topics. Yet my students navigate the vast resources of the Internet; evaluate recorded performances; wrestle with facsimiles of original publications; listen to pertinent podcasts; survey decades of scholarship in digitized form; circulate their drafts electronically; explore the cultural topography of early modern London; and contemplate the historical richness of the English language. Close learning is entirely compatible with engaging in meaningful conversations outside the classroom; faculty can correspond regularly with students via e-mail, and keep in close contact via all kinds of new media. But this is all in service of close learning, and the payoff comes in the classroom. Teachers have always employed "technology" – including the book, one of the most flexible and dynamic learning technologies ever created. But let’s not fixate upon technology for technology’s sake, or delude ourselves into thinking that better technology overcomes bad teaching. 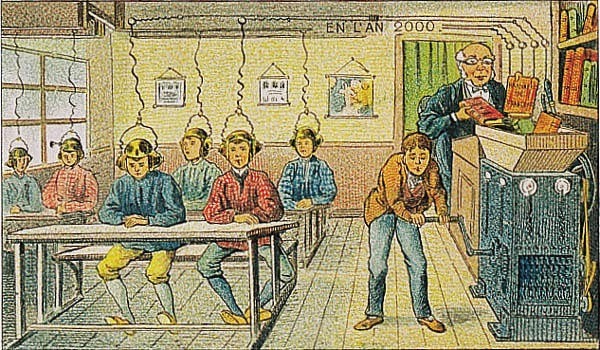 At no stage of education does technology, no matter how novel, ever replace human attention. Close learning can’t be automated, or scaled up. What remains to be seen is whether we value this kind of close learning at all levels of education, enough to defend it, and fund it, for a wider circle of Americans – or whether we will continue to permit the circle to contract, excluding a genuinely transformative educational experience from those without means. Liberal Arts at the Brink?